and one look at the results make me have a hope that this can happen :95% agree and 5% disagree - not even a close call. I even put my best reading glasses to make sure of the numbers, not just looking at the bar graph. And I was like "WHAAAAT?!?" 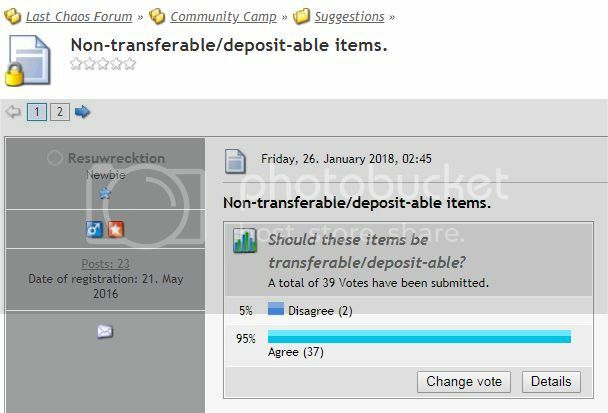 I admit that my English is not very good, but back when I went to school I had fair marks in Math so for me 95% of voters agreeing with the suggestion and 5% disagreeing means that my fellow players DO feel that Resuwrecktion's suggestion is a GOOD one. Please help me make sense of that, because I'm lost here. Lol...when I read it yesterday, I was curious about the same - but my guess is Vilya just messed up the copy/paste texts with the reply. I have corrected my response, thanks for letting me know. I have moved this out of the suggestions forum as it is not a suggestion however. Does that now mean it's do-able and can be added to a future update option list ? It means it will be passed along to those who would know if it is or is not doable and up to them to determine if it will be doable.